So far we have covered a lot of different topics! Some have been review but we have also been going over some new material like time and professions. Below are some worksheets we have used to practice. For professions, I introduced some of the more well known professions and compiled them in a crossword that the kids really enjoyed! The clues were in English so they had to write all the answers in French. It was a challenge for them, but they all helped each other out, especially since some of the clues indicated different spellings for the masculine and feminine version, i.e. le danseur (the male dancer) and la danseuse (the female dancer). Some other vocabulary on this sheet include secrétaire-secretary, juge-judge, avocat-lawyer, pompier-fireman, médecin-doctor, étudiant-student, vendeur-salesperson, actrice-actor, vétérinaire-veterinarian. We also had a lot of fun learning time! 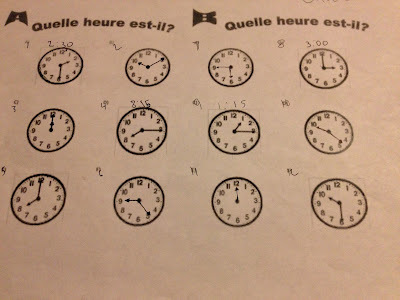 The worksheet down below had half the clocks already filled in with a time and the rest were empty. 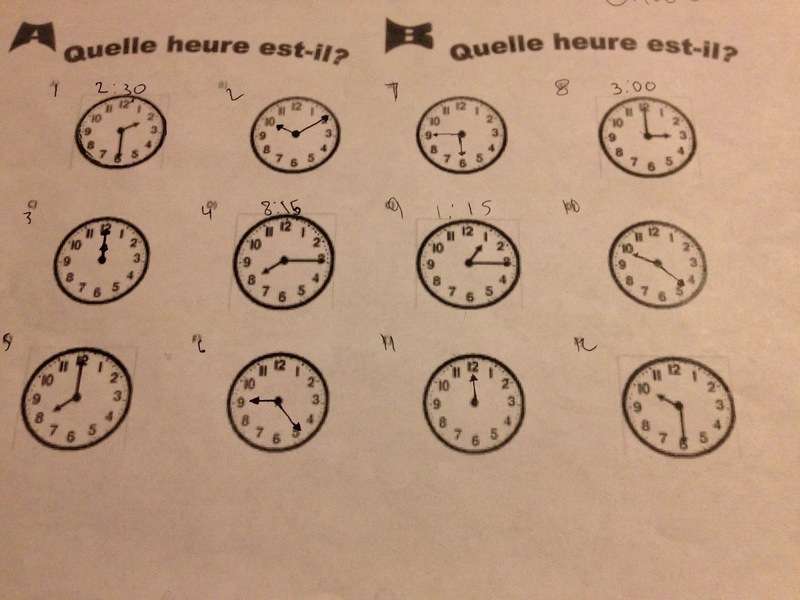 This allowed me to ask them individually what time it is (Quell heure est-il? Il est 2h30) and tell them the time for the fill ins (Il est 22h10). Lastly I recently made some reference posters with common questions, phrases and accents to hang on the wall to help them in class. This has been a huge aid in allowing them to engage in the target language! Beginning Spanish at Birch Lane!